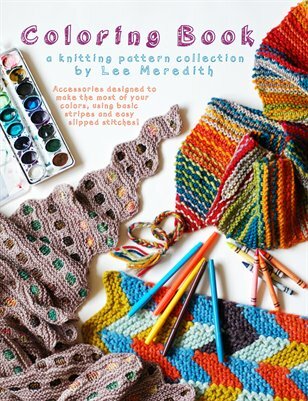 A knitting pattern collection by Lee Meredith - accessories designed to make the most of your colors, using basic stripes and easy slipped stitches! With this book, you’ll use techniques to help your colorful projects go more smoothly, so that you can knit hats, shawls, scarves, cowls, headbands, mitts, and blankets which will really show off those colors, while keeping the back sides neat, and ending up with much less finishing work than you might expect! For more information, see leethalknits.com or find the collection on ravelry.com.